I used to be able to travel back to Boston all the time for work. It was great because I got to see family and friends and stay connected to my hometown in a way I can’t do now. However, I would be lying if I said it didn’t also have to do with frequent stops to the Paramount, an awesome diner like place on Beacon Hill. Open since 1937 this place is always packed but worth the wait. My standard lunch order was the roasted turkey Rachel with sweet potato fries. If you have never had a Rachel, its basically a Ruben sandwich with turkey and coleslaw instead of sauerkraut. The mix of the tangy Russian dressing with the hearty turkey and the rye bread make me super happy. Since I no longer get to fly up to Boston for one every couple of weeks I started craving it big time. That’s when the idea to deconstruct the Rachel came to me – turn a lunch classic into a dinner staple. In place of the rye bread I simply breaded turkey cutlets with breadcrumbs mixed with caraway seeds (the nutty yummy flavor you get in rye bread comes from those seeds). Then the Russian dressing and coleslaw come together as a bed for the turkey cutlet. To elevate this a bit I made my own Russian dressing and used bagged broccoli slaw which is much more crunchy and flavorful then the cabbage kind. A bite of the cutlet with the slaw together and BAM you have a Rachel sandwich! This dish will definitely get me through until the next time I can go to the Paramount. Serve it for a totally outside the box Thanksgiving with some hoppy beer and I am sure your friends and family will flip. Have a great holiday!! In a medium size bowl combine the mayo, Worcestershire sauce, chili sauce, apple cider vinegar, and hot sauce. Season with salt and pepper. Stir in the broccoli slaw making sure it is all combined. This can be done several hours in advance, store in the fridge and just take it out 30 minutes before serving to take the chill off. Set out three bowls for breading – one with the breadcrumbs and caraway seeds in it, one with the flour and one with the egg, beaten with a splash of water. Set out a plate or cookie sheet to place the breaded cutlets on. First tip each cutlet in the flour, shake off the excess, then dip in the egg, making sure to coat the entire thing and then finish in the caraway breadcrumbs, pressing them on to make sure they stick. Once all the cutlets are breaded heat 1 tablespoon of butter and 1 tablespoon of olive oil in a skillet over medium high heat. Once they are hot add as many cutlets as comfortably fit in. Cook 3 minutes per side and remove, add the remaining butter and oil to the pan and cook the remaining cutlets. Serve the cutlets on top of the slaw mixture. In a medium size bowl combine the mayo, Worcestershire sauce, chili sauce, apple cider vinegar, and hot sauce. Season with salt and pepper. Stir in the broccoli slaw making sure it is all combined. This can be done several hours in advance, store in the fridge and just take it out 30 minutes before serving to take the chill off. Set out three bowls for breading – one with the breadcrumbs and caraway seeds in it, one with the flour and one with the egg, beaten with a splash of water. Set out a plate or cookie sheet to place the breaded cutlets on. First tip each cutlet in the flour, shake off the excess, then dip in the egg, making sure to coat the entire thing and then finish in the caraway breadcrumbs, pressing them on to make sure they stick. Once all the cutlets are breaded heat 1 tablespoon of butter and 1 tablespoon of olive oil in a skillet over medium high heat. Once they are hot add as many cutlets as comfortably fit in. Cook 3 minutes per side and remove, add the remaining butter and oil to the pan and cook the remaining cutlets. Serve the cutlets on top of the slaw mixture. For those of you who didn’t come up with your Thanksgiving menu months ago (better known as sane people) I decided to post some ideas from the A Capitol Contessa archive to inspire you. I also included a couple of vegetarian main dishes if folks in your family don’t do turkey. This year we are having a small group, just 4 people, but for a special meal you should always go all out on the table. I based my table around antique “turkey plates” that were my grandmother’s. They don’t have turkeys on them, actually they show scenes of Boston, but since they were used every Thanksgiving, my mom, aunts and uncles started calling them the turkey plates and it stuck. My own wedding china, Vera Wang for Wedgewood, goes really nice on top as a salad plate. To add some texture I used these Pier 1 Rattan Chargers (on sale now!) and tortoiseshell napkin rings. To add some sparkle I used my favorite gold flatware set from Target and my new Gem Toned glasses from Pottery Barn in Amber. Thanksgiving is definitely were you want to use a tablecloth instead of place mats to catch errant gravy drips. I used a neutral beige once (similar here) – now all I need is flowers, a pitcher of water and lots of wine and my table is all set. If you are having an even smaller Thanksgiving for 1 or 2 people I am posting a great weeknight turkey dish on Thursday that would work well. Next week we will be dark for the holiday but when ACC returns it will be all holidays all the time! What could be better the day before Thanksgiving than a nice hot steaming mug of mulled cider with a healthy dose of bourbon?? This is a great drink to savor when you get home from work (hopefully early) and before you start all the prep for the big day – or maybe to settle yourself right before all the guests arrive. Even better make several batches and keep it warm in a slow cooker so people can help themselves throughout Thanksgiving. Either way it’s a great drink to have in your arsenal. I am super thankful this year for the support of my friends and family, especially Patrick, as I have undertaken this adventure. I hope everyone has a delicious Thanksgiving! In a saucepan combine everything but the bourbon over medium heat. Let the flavors combine for at least 15 minutes before serving. 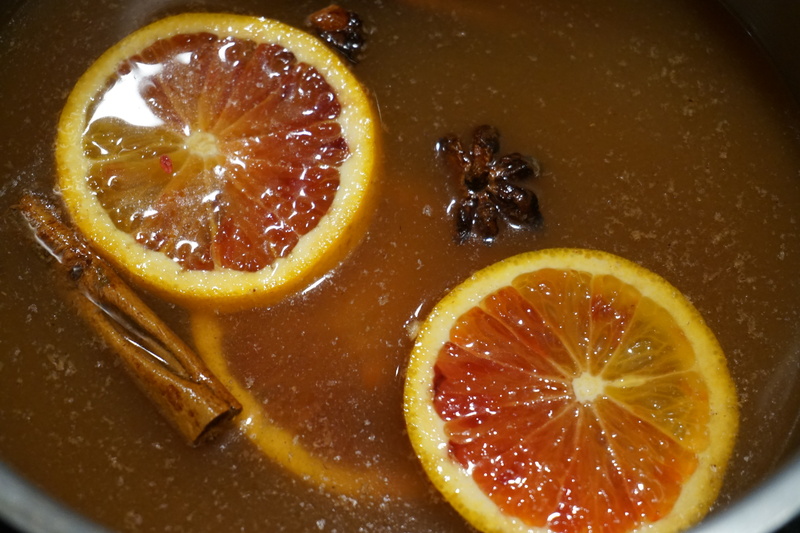 (or leave in a slow cooker set on warm) Divide the bourbon if using among the mugs and top with the hot cider. In a saucepan combine everything but the bourbon over medium heat. Let the flavors combine for at least 15 minutes before serving (or leave in a slow cooker set on warm). 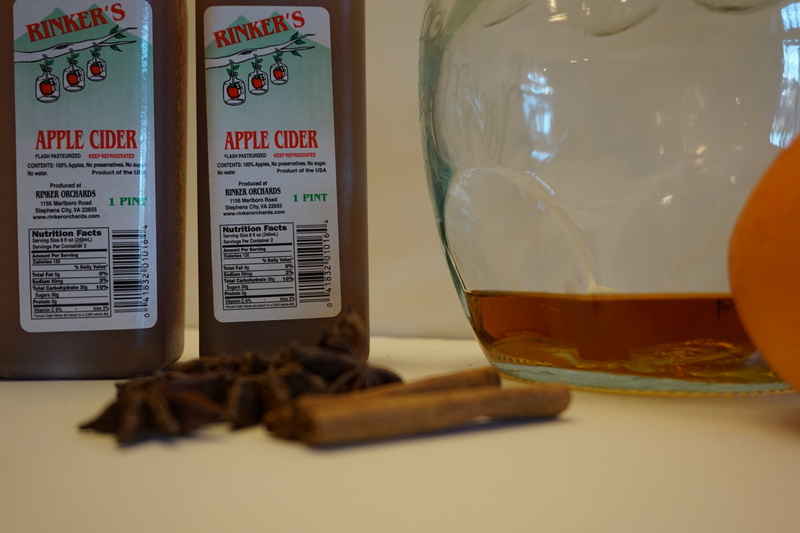 Divide the bourbon if using among the mugs and top with the hot cider. 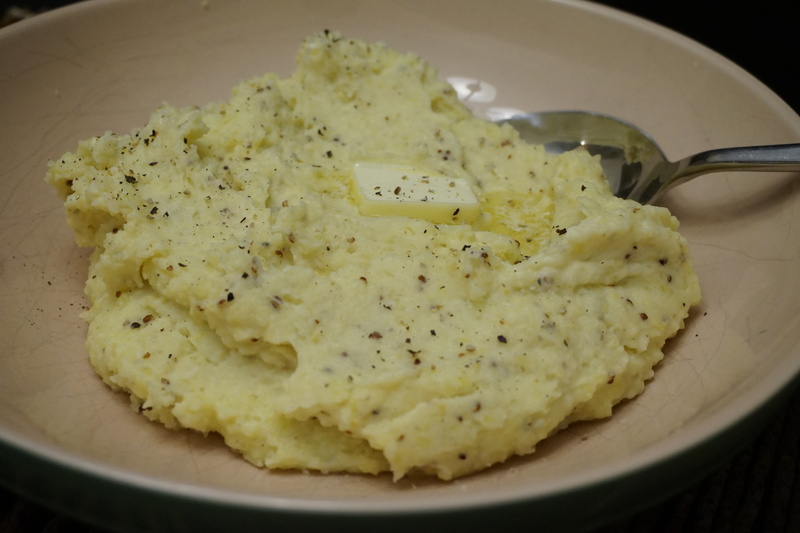 I assume you all know how to make mashed potatoes – even my friends who are cooking neophytes can handle this classic. But for the biggest meal of the year you don’t want just regular old mashed potatoes right? By using a ricer instead of a masher or a mixer you can insure the fluffiest texture. By adding cream plus butter plus buttermilk you will arrive at a creamy, tangy and silky blend. My dad taught me the trick of including peeled garlic cloves in with the potatoes when you boil them. The garlic gets soft and mellow and then you can blend them in with the potatoes and get a light garlicky taste. Then just when you thought it couldn’t get better you fold in some nice grainy mustard at the end. These mashed would be great anytime but they will go particularly well with your turkey and stuffing this thanksgiving. Peel and cut the potatoes into 1 inch pieces (try and keep them around the same size so they cook evenly). Place in a pot with cold water and the garlic cloves (you can store the potatoes like this for an hour or two). Add some salt and turn the heat to high. The water will eventually start boiling but keep the potatoes on high and cook in total for about 20 to 30 minutes until tender. You can test them with a pairing knife or fork – if the knife easily pierces the potato it’s ready. While the potatoes cook warm the cream and 3 tablespoons of butter in a small saucepan over low heat. Drain in a colander then set the ricer over the pot (if you don’t have a ricer return the potatoes to the pot and use a hand mixer). Squish the potatoes and garlic cloves through the ricer, scraping the sides as needed. Stir in the warmed cream and butter along with salt and pepper. Follow with the buttermilk and whole grain mustard. Serve with the remaining tablespoon of butter on top. 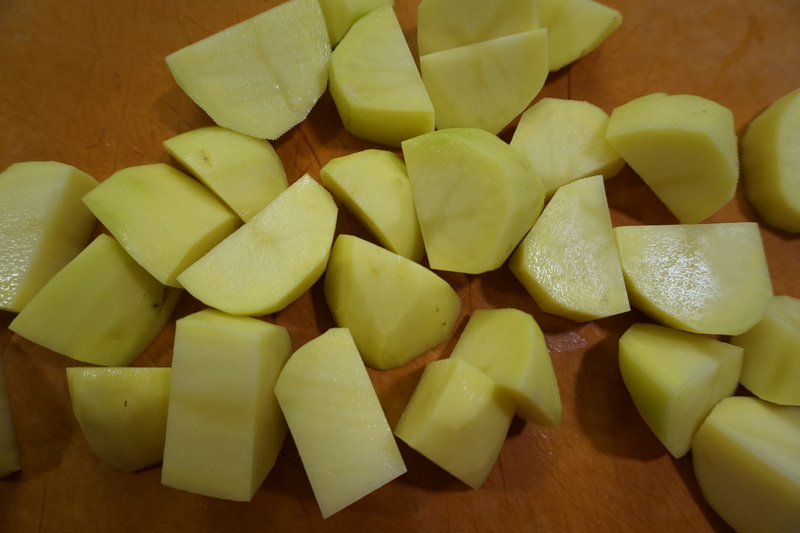 Peel and cut the potatoes into 1 inch pieces (try and keep them around the same size so they cook evenly). Place in a pot with cold water and the garlic cloves (you can store the potatoes like this for an hour or two). Add some salt and turn the heat to high. The water will eventually start boiling but keep the potatoes on high and cook in total for about 20 to 30 minutes until tender. You can test them with a pairing knife or fork – if the knife easily pierces the potato it’s ready. While the potatoes cook warm the cream and 3 tablespoons of butter in a small saucepan over low heat. Drain in a colander then set the ricer over the pot (if you don’t have a ricer return the potatoes to the pot and use a hand mixer). 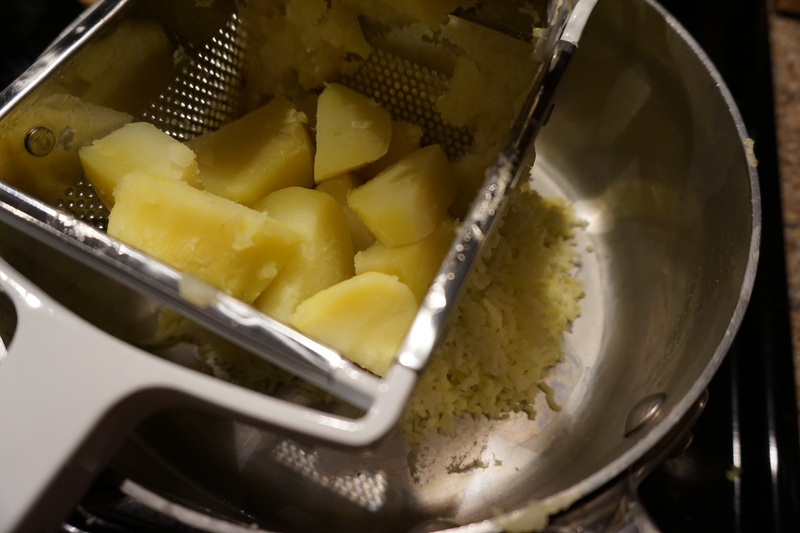 Squish the potatoes and garlic cloves through the ricer, scraping the sides as needed. Stir in the warmed cream and butter along with salt and pepper. Follow with the buttermilk and whole grain mustard. Serve with the remaining tablespoon of butter on top. Soup is the best first course for any dinner party but especially Thanksgiving. Make it in advance, even weeks ahead, and then just warm it up right before you want to serve it. 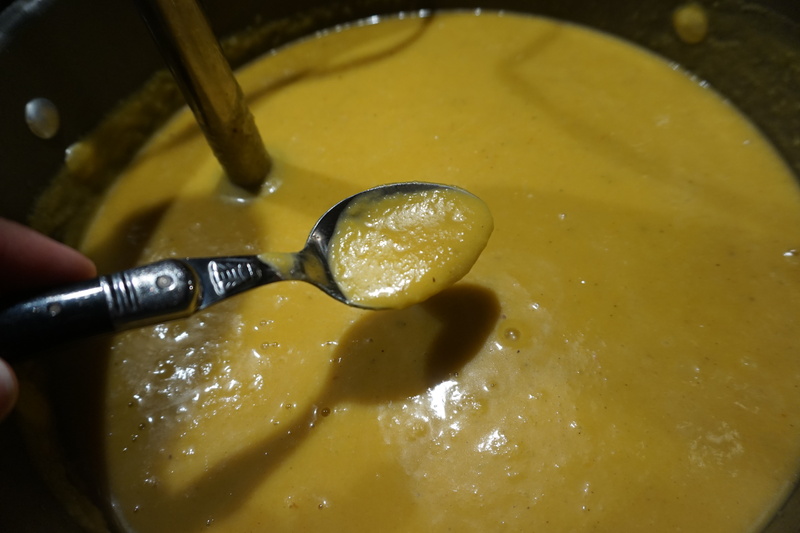 I make a ton of soups in the winter and give my immersion blender a workout. I have this Cuisinart one and it’s great, trust me more expensive brands are not worth it. They are perfect for smoothies in the morning but more importantly it means not having to transfer hot liquids into your blender. Any kitchen tool that reduces the risk of injury is worth it in my book and they take up minimal space. Immersion blenders are also great for making creamy soups…without cream! By blending hearty vegetables like butternut squash or cauliflower you get a nice rich, creamy texture with none of the fat. Since this is such a low cal veggie heavy soup I figure we deserved a little something for our effort and grated some goat cheese on top – not chevre, the typical soft creamy goat cheese but something a little more aged. 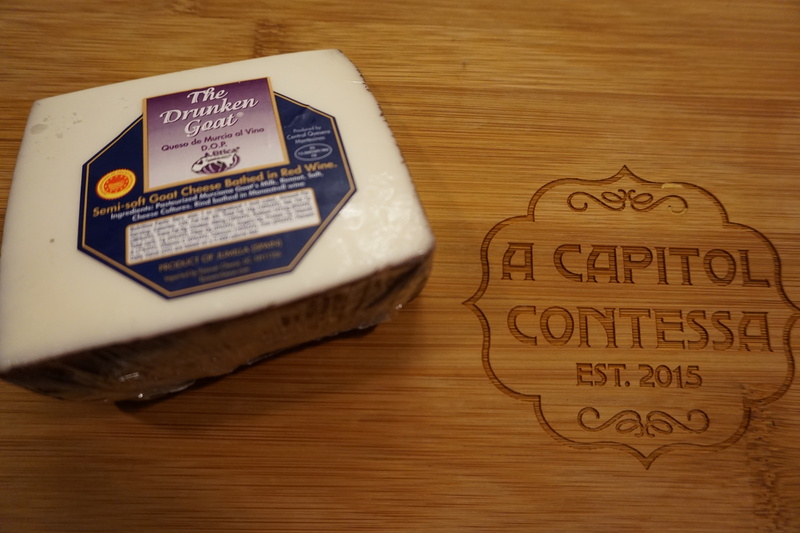 One of my favorites is the Drunken Goat, a semi soft goat cheese that has a red wine rind, but anything with a nice tang to it will work (also feel free to omit if you want to make this vegan just remember to swap out the chicken broth for veggie broth). A few snips of chives add a nice green and some fresh flavor as well. I like to make a full batch of this soup and freeze it in individual containers for lunches or cold winter nights. Heat your oven to 450 degrees. 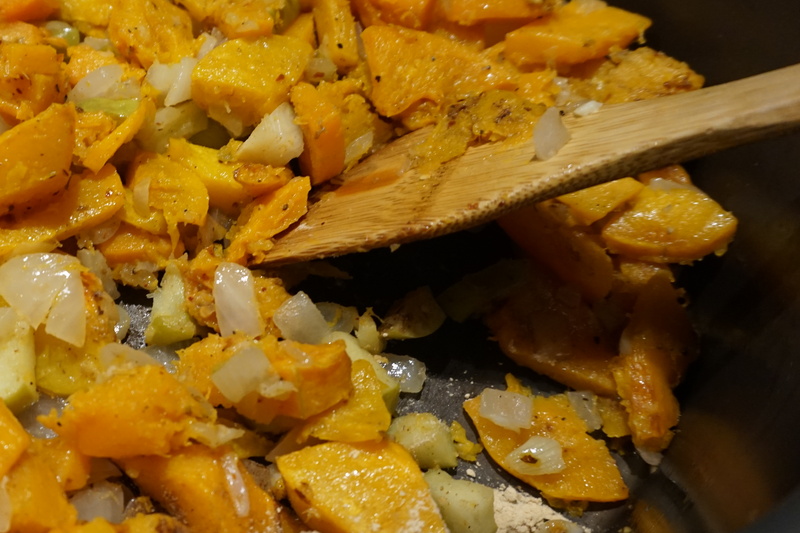 Spread the butternut squash out of 2 baking sheets and toss them with 2 tablespoons on olive oil and salt and pepper. Roast for 15 minutes then toss the squash on each sheet and then roast for 15 minutes more. (This is a great way to eat butternut squash – you could eat it as is or maybe with some parmesan grated on top). In a large dutch oven heat the remaining tablespoon of olive oil and a tablespoon of butter over medium heat. 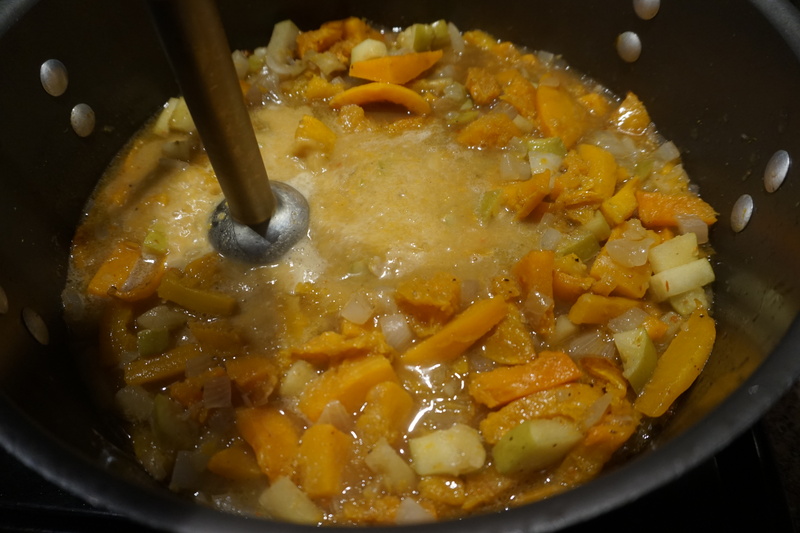 Add the apple, onion and garlic and cook for 10 minutes until the apple and onion are cooked through and softened. Add the roasted butternut squash to the apple mixture along with the allspice, ground ginger, crushed red pepper, and coriander. Cook for a minute, stirring until everything is combined. Pour in the broth and water, stir everything together and bring to a simmer. Simmer for 15 minutes, then turn off the heat. If you have an immersion blender go ahead and blend away until completely smooth in the pot. If not let it cool a bit and then CAREFULLY transfer to a blender. Now the soup is ready to serve or let cool and freeze for 6 months. For each serving top with a handful of grated aged goat cheese and several snips of chives. Heat your oven to 450 degrees. 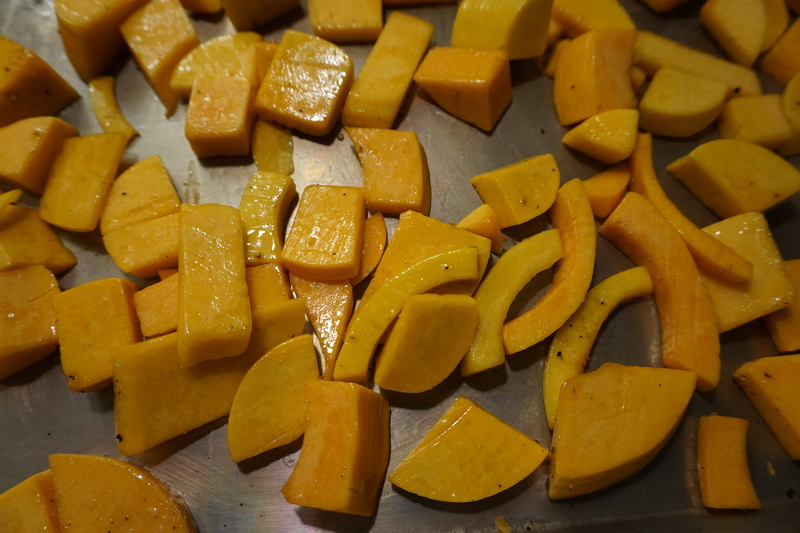 Spread the butternut squash out of 2 baking sheets and toss them with 2 tablespoons on olive oil and salt and pepper. Roast for 15 minutes then toss the squash on each sheet and then roast for 15 minutes more. (This is a great way to eat butternut squash – you could eat it as is or maybe with some parmesan grated on top). In a large dutch oven heat the remaining tablespoon of olive oil and a tablespoon of butter over medium heat. Add the apple, onion and garlic and cook for 10 minutes until the apple and onion are cooked through and softened. Add the roasted butternut squash to the apple mixture along with the allspice, ground ginger, crushed red pepper, and coriander. Cook for a minute, stirring until everything is combined. Pour in the broth and water, stir everything together and bring to a simmer. Simmer for 15 minutes, then turn off the heat. If you have an immersion blender go ahead and blend away until completely smooth in the pot. If not let it cool a bit and then CAREFULLY transfer to a blender. Now the soup is ready to serve or let cool and freeze for 6 months. For each serving top with a handful of grated aged goat cheese and several snips of chives. Ok there is plenty of candy around at Halloween – dessert seems like overkill. But this cookie has oats in it! Don’t you feel virtuous already?? We get a million trick o’ treaters so having something to snack on while drinking wine and passing out candy is a good thing. You can also make these cookies with peanut butter chips but the Reese’s gave them a nice Halloween look. Two important tips to take away from these cookies that work for all drop cookies – first make sure to really cream the butter and sugar together. I used to just mix the two until combined but once I started really letting my mixer go to work until the butter and sugar gets light in color and fluffy, my cookies are much lighter and softer. 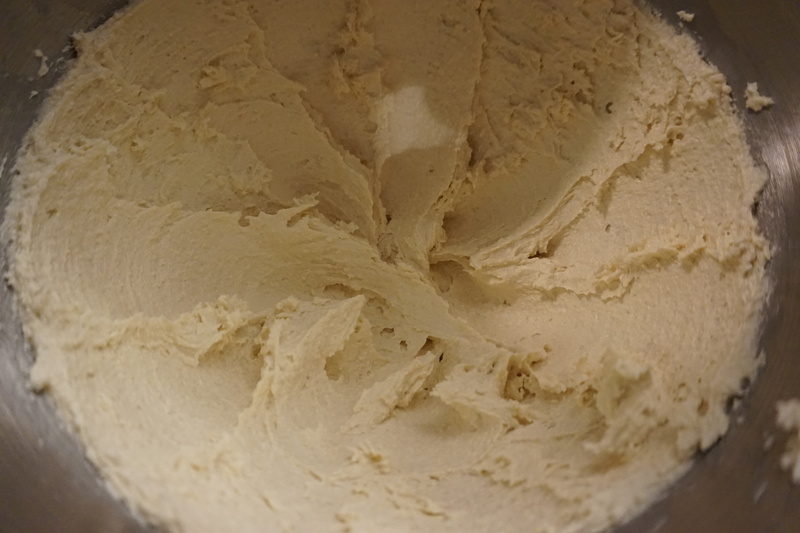 You cannot over beat the batter before the flour has been introduced so really work the butter and sugar for as long as your arm can take it if you are using a hand mixer or about 3 minutes if you have a stand mixer. Second tip is to chill your dough. At least 20 minutes is good but you can also store the dough in the fridge for a couple of days. Drop cookies if the dough is too warm will spread when they bake and you will end up with a flatter, crunchier cookie than you want (or perhaps even the dreaded one giant cookie melted together). Wednesday I will be posting the perfect dinner to go along with these cookies and trick or treating and then Friday will be a special cocktail to wash it all down with. Pre heat the oven to 350 degrees. Cream the butter and sugars in a large bowl or a stand mixer – mix for 3 minutes until light and fluffy. While the butter and sugar is mixing combine the flour, baking soda, salt and cinnamon in a small bowl with a whisk. Add the egg and vanilla to the butter and sugar and mix until combined. Stir in the oats and Reeses Pieces with a spoon and then refrigerate for 20 minutes. Drop the cookies on sil pat or parchment paper lined cookie sheets and bake for 12-14 minutes until golden. 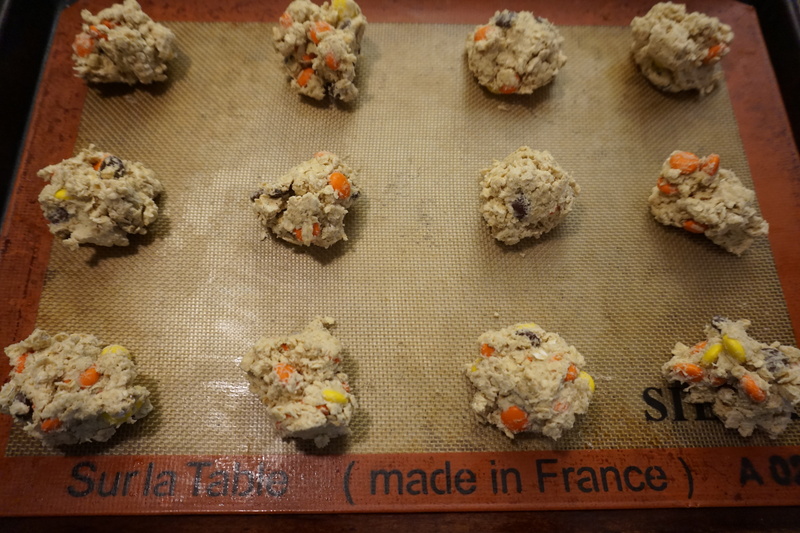 Let cool on a baking rack – the cookies can be stored for several days. Pre heat the oven to 350 degrees. Cream the butter and sugars in a large bowl or a stand mixer – mix for 3 minutes until light and fluffy. 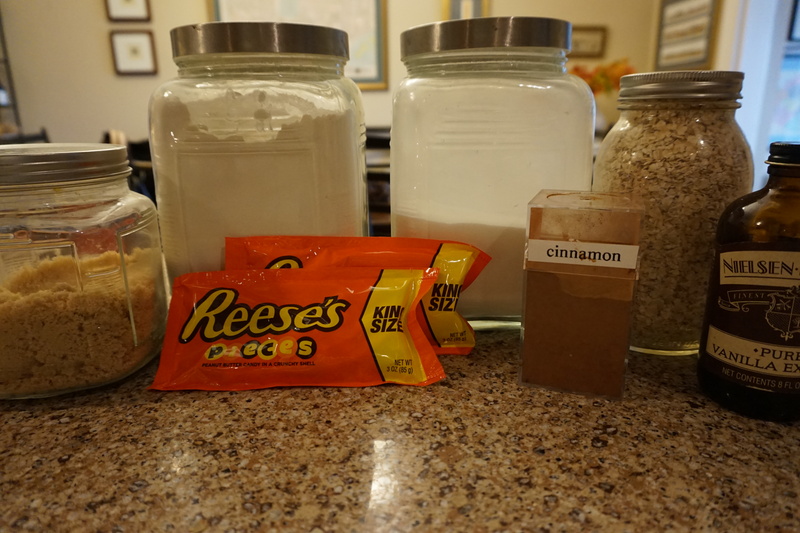 While the butter and sugar is mixing, combine the flour, baking soda, salt and cinnamon in a small bowl with a whisk. Add the egg and vanilla to the butter and sugar and mix until combined. Stir in the oats and Reeses Pieces with a spoon and then refrigerate for 20 minutes. Drop the cookies on sil pat or parchment paper lined cookie sheets and bake for 12-14 minutes until golden. Let cool on a baking rack – cookies can be stored for several days.